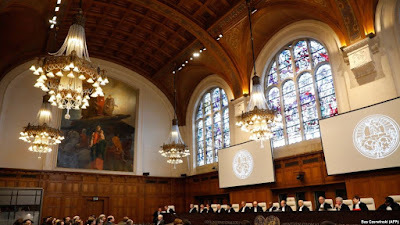 THE HAGUE, Netherlands -- The International Court of Justice (ICJ) says it will issue a ruling on April 19 on Kiev’s bid to block Russia from sending money, weapons, and troops to eastern Ukraine. The International Court of Justice holds a public hearing in the case of Ukraine vs. the Russian Federation on March 6. The ruling will take place at the Peace Palace in The Hague in the Netherlands, the ICJ said. The event will be streamed live on the court's website. Moscow seized control of Ukraine's Crimean Peninsula in March 2014 and has supported separatists in eastern Ukraine in fighting that has killed more than 10,000 people. Kiev is also calling on the ICJ to order Russia to stop what it says is "racial discrimination" against minority groups in Crimea, particularly against the Tatar population. The ICJ was established by the United Nations in 1945 to hear disputes between states. Cases can take years to pass through the court and Ukraine has also filed to seek interim protection measures. Although the court's rulings are final and binding, it has no means of enforcement. Kiev accuses Russia of violating UN conventions against terrorism and discrimination by supporting groups in eastern Ukraine and Crimea. Ukraine’s case called on the court to rule that "the Russian Federation bears international responsibility" for "acts of terrorism committed by its proxies in Ukraine." Kiev is seeking to force Russia to pay compensation to civilians caught up in the conflict.